Our high school equestrians returned from a magnificent spring break trip to Portugal, which provided a wonderful opportunity to experience dressage on highly-trained Lusitanos in the most amazing setting imaginable! The equestrian center, Quinta do Rol, is part of a much larger ranch set amid rolling green hills that grows apples, citrus and wine grapes. 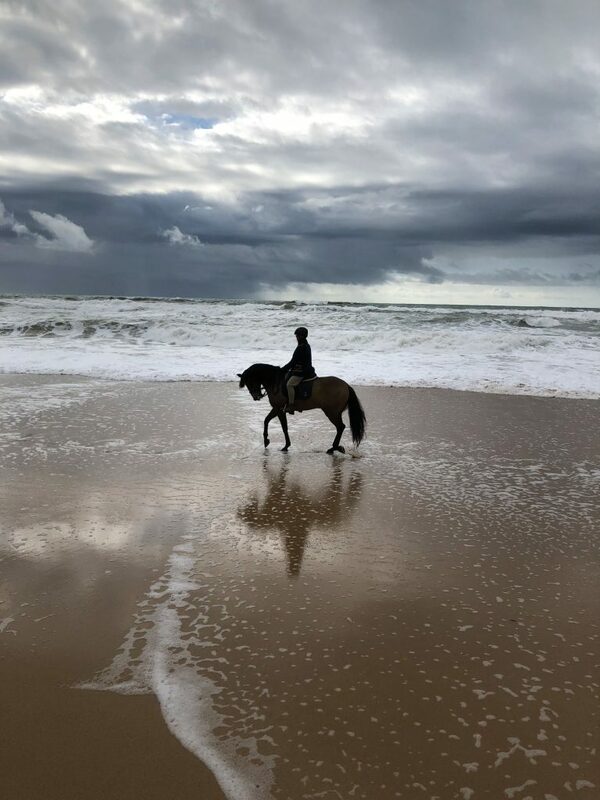 “The facility, the horses, instructors and accommodations were superb and every rider came away from the experience having learned and experienced new things, from learning to canter, flying changes, tempi changes, piaffe, passage to an exhilarating ride on the beach,” said Equestrian Director Stephanie Gustafson. Students Ivy Sun, Sharon Ye, Cici Feng, Lico Chan, and Morgan Dreier toured extensively in the region, visiting royal palaces, monasteries and charming fishing villages. They finished the trip visiting Sintra and Lisbon. With only a week to prepare after Spring Break, our combined middle and high school equestrian team—Lilli Trompke, Jaclyn Sersland, El Giguire, Hannah Little, and Anna English—hit the ground running for the annual two-day Pony Club Mega Rally in Los Angeles. The riders were judged both on their riding and stable management. For tack room organization and cleanliness the judge’s comment was “perfection.” The first day of jumping was a bit less than perfect, but the riders discussed what went wrong and managed those issues on the second day of jumping with clean rounds. Overall, OVS finished in 4th place. The team finished 2nd in Horse Management. Click here to see photos from the Equestrian Portugal Trip.